Apologies for the strange title – I’ve been doing rather a lot of Tweeting recently! 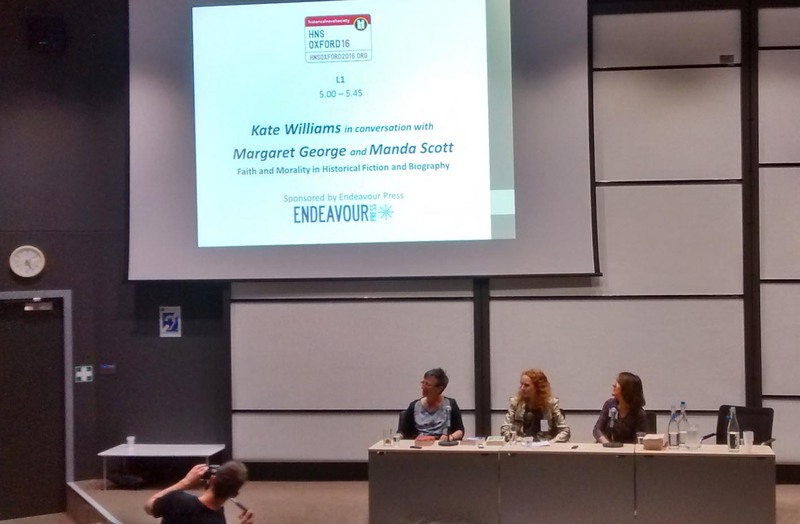 Last week I promised to write about the Historical Novel Society conference in Oxford. 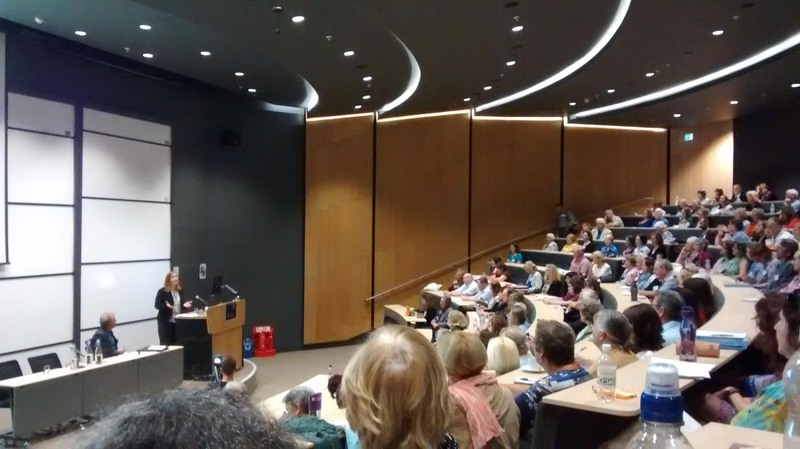 With getting on for 300 attendees: writers, readers and others interested in writing historical novels, most of whom probably write blogs, why write another? Why read another? Because I promised, and I always keep my promises and also because everyone’s experience will be different. This is mine. I arrived at St Anne’s College about 4.30 Friday afternoon, pushed out of a car further down the road (where were you supposed to park?) in a torrential downpour. It didn’t seem like an auspicious start. A change of clothes and a cup of coffee later and I was ready to cross the road to the Andrew Wiles Building. Of course I was early, but there seemed to be no-one about – eventually I realised everything was happening downstairs. I collected my badge, picked out a goody bag and settled down to rummage through it. I discovered that others were more interested in the weight of the bag, rather than the contents. They were those who had travelled from afar – I was amazed to discover how many had come from the U.S. It put my one and a half hour drive in perspective. 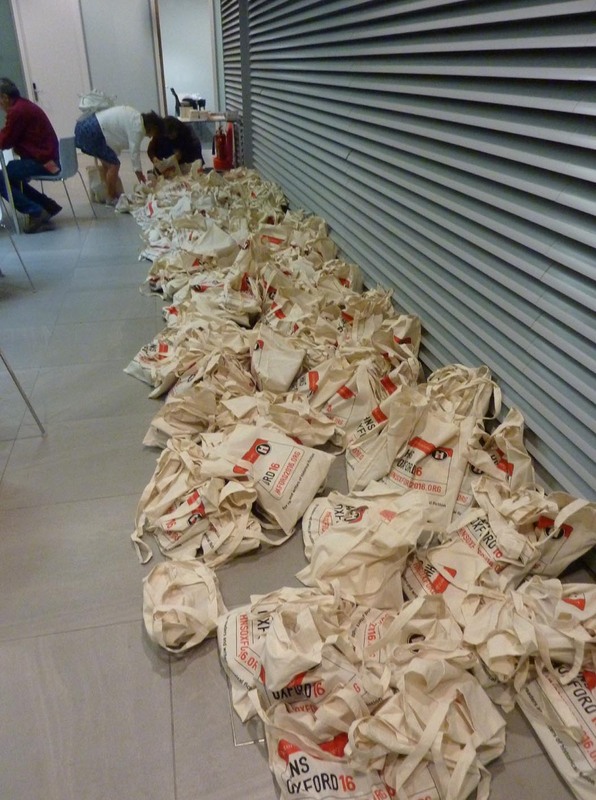 Plenty of Goody Bags – which to pick? Then it was time for the official Welcome and “The Big House Story” – a conversation with Fay Weldon and Jo Baker. 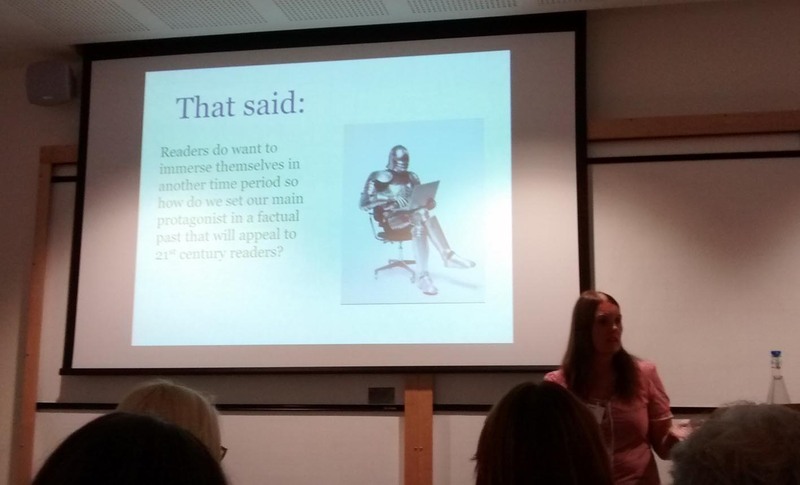 This was an interesting discussion about writing from the point of view of servants, such as Longbourn, Jo’s book inspired by Pride and Prejudice. I think there might have been a problem with Fay Weldon’s microphone as I had difficulty hearing her. I should say here that apart from this, the sound was excellent in the main hall and the other venues. This was followed by Wine and Canapés. I wish I had stopped chatting long enough to taste more of the enticing canapés. We were turned out at 8.30, so I retired to the pub opposite. Shared a table with three Americans and two other Brits. Interesting that I was the only one writing about British history. Fay Weldon and Jo Baker discuss servants. I slept very well in my comfortable garret (up three flights of stairs) and was practically first in line for breakfast (very good). 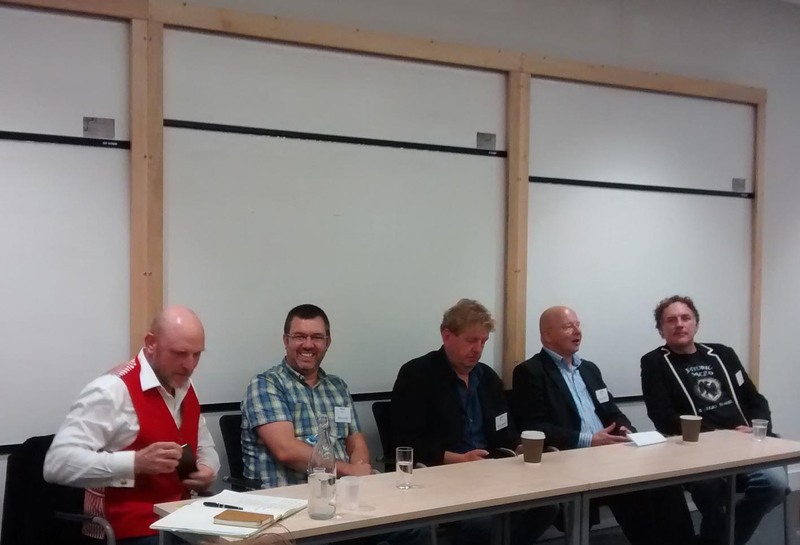 First on for Saturday was a Panel Session “The Next Big Thing in Historical Fiction.” To which the answer is “Nobody knows.” Agents are looking for one thing, publishers another; you must please the marketing department and attract the book shops. The Tudor era is overloaded, but a WW2 saga might be popular. Straight after this was the session I was looking forward to: “Building a Shield Wall.”, run by Paula Lofting and other members of Regia Anglorum. The first thing we were told was that the Angl0-Saxons didn’t drink mead. So that’s half my book out the window! We found out a lot about the clothing – especially how difficult it is to get into a mail shirt, especially in front of a large audience in a very small room. We discovered the difference between round and kite shaped shields and the advantages, and disadvantages, of fighting on foot and on horseback. 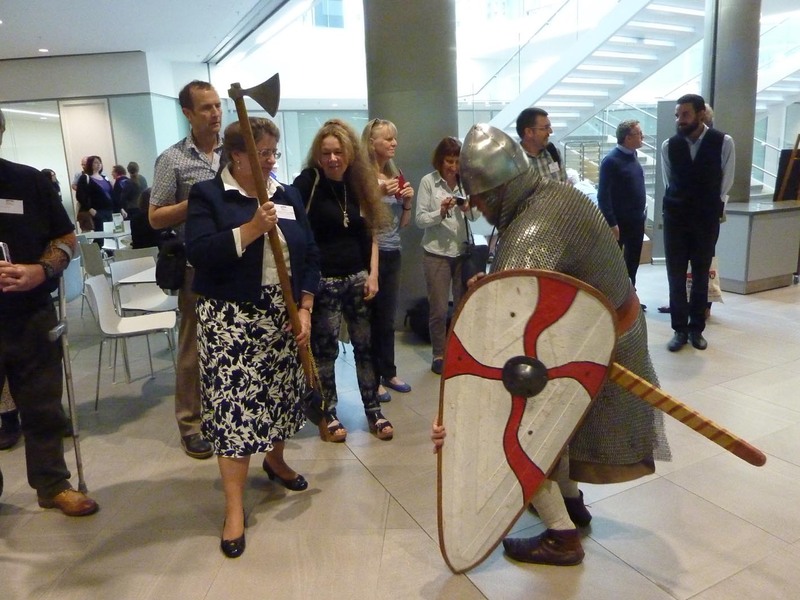 They moved out into the atrium to demonstrate the actual setting up of a shield wall, causing consternation to other delegates, who had their coffee break shattered by the cry of Ut! Ut! Ut! So that’s what the Anglo-Saxons used for their Powerpoint presentations! After all that excitement we returned to the main hall for the Keynote address by Melvyn Bragg. His latest book, “Now Is The Time” is about the Peasants Revolt and he talked about the difference between Historical Fact, which you have to obey, and Historical Fiction, which is the bits that you don’t know. You can make it up but must stick to the spirit of the character. If you research enough around the events, you should be able to recreate what they might have said. Bought the book afterwards (although service at the bookstall was a bit slow.) and got it signed. 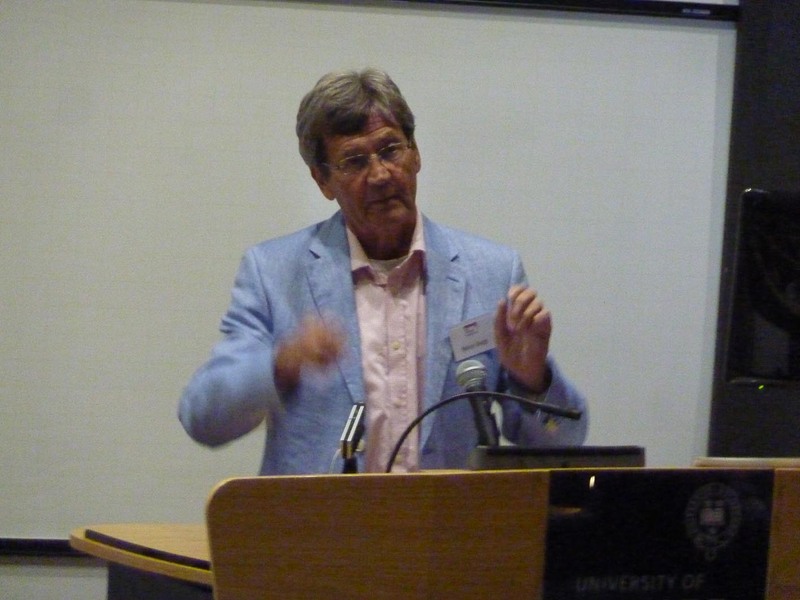 Melvyn Bragg making a point. After that was lunch, sandwiches and fruit – very nice sliced pineapple, followed by the presentation of the awards. Straight after that was another panel, Battle Scenes: Guts, gore and glory. 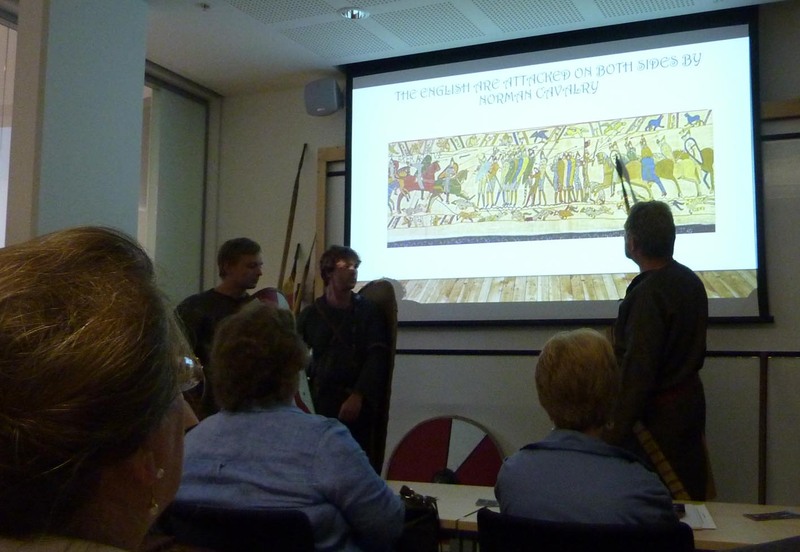 No, not a replay of the awards, but a talk by authors famous for writing dramatic and life-like scenes of battle. It was rather skewed towards the Romans – anyone would have thought that the Romans fought a lot of battles! There was much discussion of classical sources. Why did neither of the Anglo-Saxon supporters mention the Battle of Maldon! I’m not sure I learned much (about writing battle scenes) but it was an entertaining session. Time for a cup of coffee. Biscuits were advertised but I didn’t see them – just as well. Then it was into another workshop: Creating Fictional Historical Characters, with Jean Fullerton. This was in the same small room that had been used for the Shield Wall re-enactors. I don’t know if someone had misjudged the numbers, but there was even less space. More people kept appearing and tables were shoved up and chairs brought in from elsewhere. We learned the does and don’ts of creating heroes and villains. I must have been getting tired as all I remember was the warning – “Don’t kill the kittens!” your reader will never forgive you. The final session was back in the main hall Kate Williams, Margaret George and Manda Scott on “Faith and Morality in historical fiction and biography.” Like the last session, this was about thinking about the differences between how people lived and believed in earlier times and how we think about things nowadays. There was a discussion about how you can never get the truth of any event, however modern. We can only do the best we can with what we have. This was followed by an Introduction to HNSUS17 to be held in Portland, Oregon on June 22nd-24th, 2017. 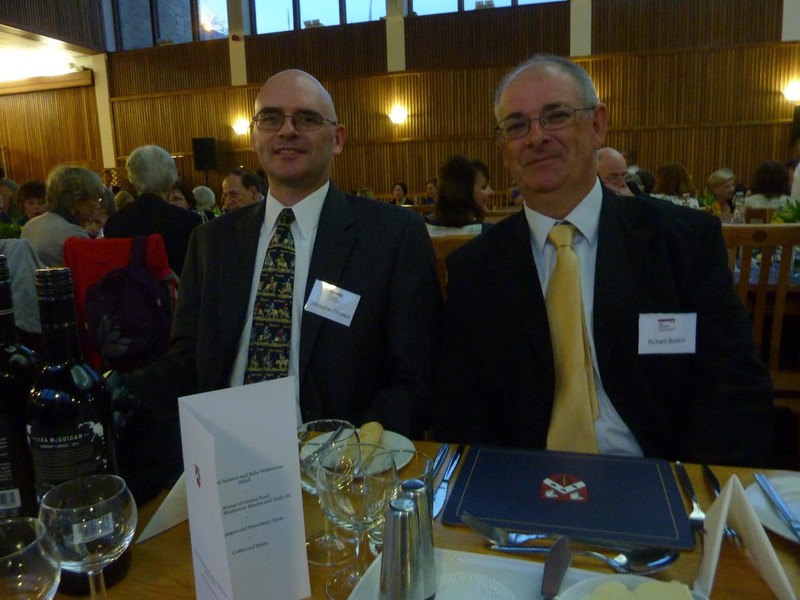 We were then allowed to go, to prepare for the Gala Dinner. Back in my room at St Anne’s, I lay exhausted on the bed. Could I take any more? Yes I could. After a wash and brush up I descended the three flights of concrete stairs in my posh dress and glittery shoes. It was a short walk to the Dining Hall. It seemed a long time since breakfast that morning. Music was playing and wine bottles were on the tables. 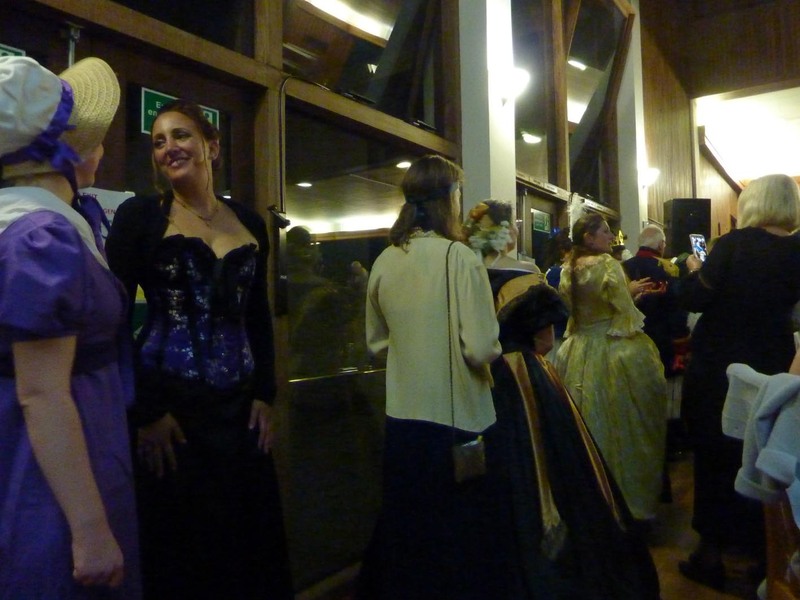 Here and there were delegates dressed in historical costume, ready for the Costume Pageant. I was joined by Clare Lehovsky whom I had met on an Arvon course at The Hurst, a year ago. I had met other friends from that course during the conference, so it was something of a reunion. An American gentleman sat opposite, Christopher Cevasco. We discussed our books and discovered he was also writing about the 10th century. I don’t know if there were any more in the room, not many I suspect. Also sitting opposite was Richard Buxton, a Welshman writing about the U.S. Confused and I hadn’t even had a drink – yet. 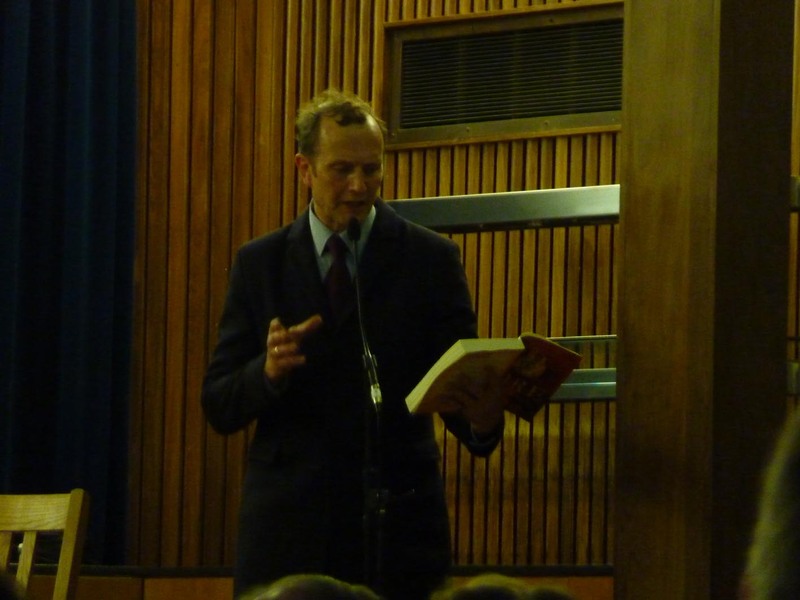 C C Humphreys reading from his book “Fire” I’ve already bought two books about 1666, do I need another? 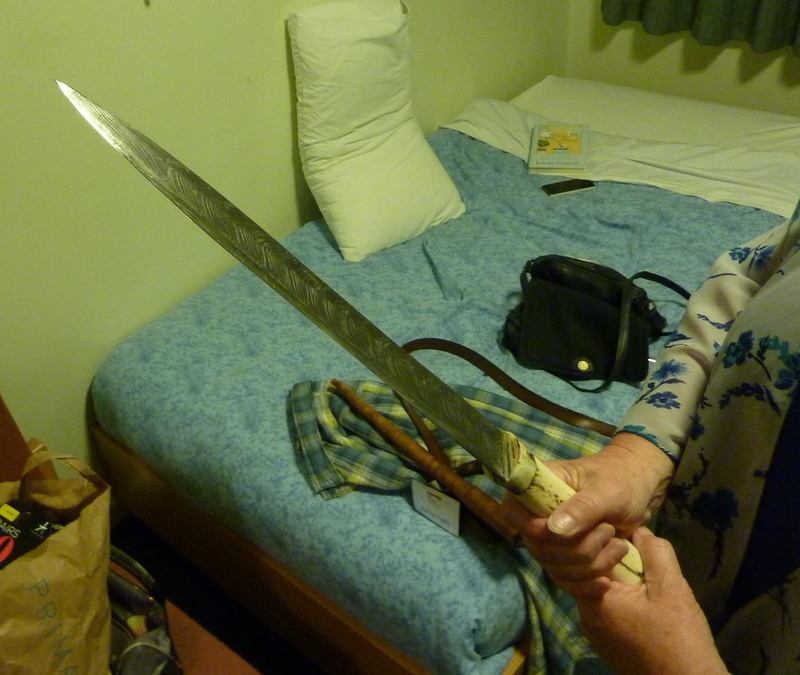 The highlight of the evening was an invitation (after much nagging) to handle a Seax. I was up bright and early the next morning for my Full English breakfast, ready for the final day of the conference. There was to be a lot of running back and forth today. I had two pitch sessions booked. I will draw a veil over them, except to say that they have given me a lot to think about. I just managed to get to the “Streets through the Ages” Panel just before it started. Here we were given descriptions of life in different eras. Gordon Jackson spoke about Romans, Carol McGrath about Medieval – 14th century (not Anglo-Saxon I’m afraid) Jenny Barden took us back to the Elizabethan period and Charlotte was not left much time for the 17th century. We were running late and everyone wanted to get to the main hall for the talk by Tracy Chevalier. It was strange to discover that such and English seeming author as Tracy Chevalier spoke with an American accent. Although she has lived here a long time but hasn’t lost it. She talked about how distancing yourself in history makes it easier to write, although you have to spend a lot of time on research. If you write about the modern-day everyone asks if it’s autobiographical! That said, we heard something about a book she has been working on recently: a re-working of Othello set in a 1970s school playground. Unfortunately I had to miss the questions part of this talk, but made it to the Session on “Time Slip; Time Travel” This is a genre which I enjoy reading. I might have a go at it myself, sometime. Anna Belfrage and Christina Courtenay explained about the difference between Time Slip, in which the characters do not actually physically travel back in time and Time Travel, when they do. You have to think carefully about the method of travel, how to emphasise the differences between your two eras. We finished with a competition. Who could think of the best method of time travel – the winner was someone who suggested shoes. I didn’t make the HistFictionalist Challenge – too busy talking again. Missed the wrap up as well. I think my sense of time was getting adrift! I had some lunch, drifted around for a bit and then left. I didn’t want to leave. I walked into the centre of Oxford and as I returned to pick up my lift, got lost. I eventually found my way back, tired and foot worn. I had to return to real life. 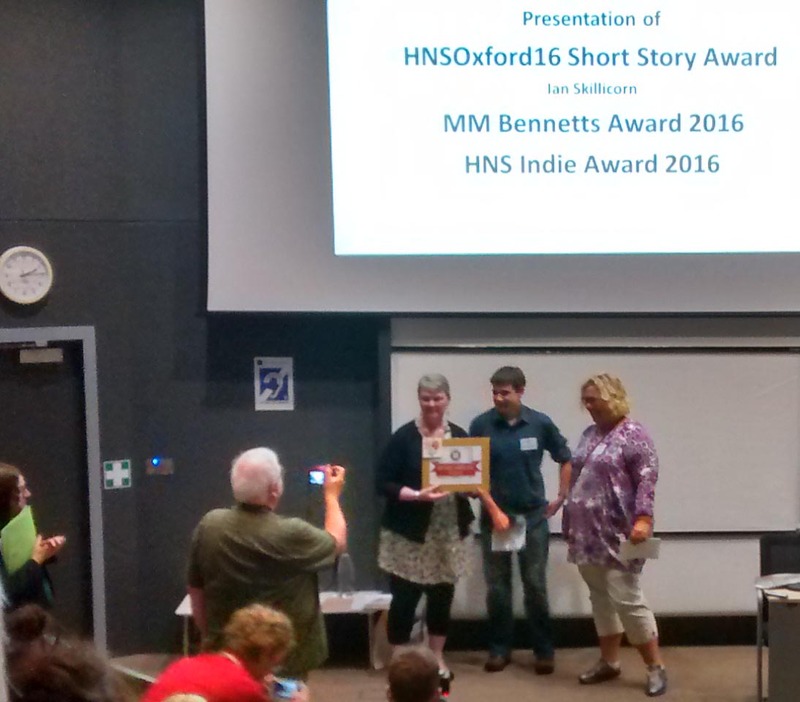 So, what did I think of my first HNA Conference? I enjoyed it immensely – so much to do, so many people to meet: old friends, new friends, twitter friends. Sorry if I haven’t mentioned you in this blog, but you are in my thoughts. Would I go again? Like a shot. Perhaps not next year, but when it is held in the UK again. 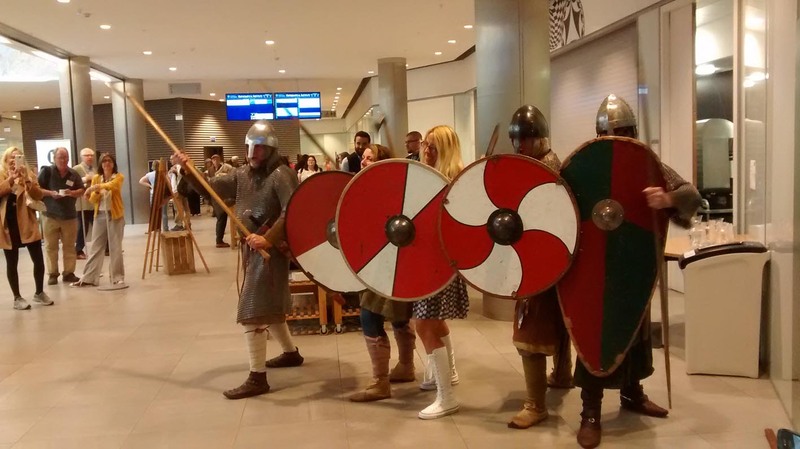 I missed the session on building a shield wall– until it moved outside the room, that is! I’d love to know what was said about the advantages and disadvantages of fighting on foot versus horseback, if you wouldn’t mind sharing. I am no expert in these matters, but as I understand it, neither the men on foot nor the horsemen have an advantage – no horse will attack a shield wall directly. The horseman rides along the front of shield wall (from left to right? ), attacking with his spear; throwing or poking through any gaps. The man in the shield wall defends himself with his shield and attacks with his spear, again by throwing etc. The man in the shield wall is safe – as long as he stands and the wall holds. The horseman has the advantage in that he can retreat and rest before attacking again. His disadvantage is that he and his horse are a larger target. If numbers are equal, no one wins. If the shield wall breaks, the horses can get through and attack from behind. At Hastings the Saxons held on all day, losing only when men left the shield wall to pursue the Normans. Other factors, such as losing your leader play a part! Wonderful write-up! 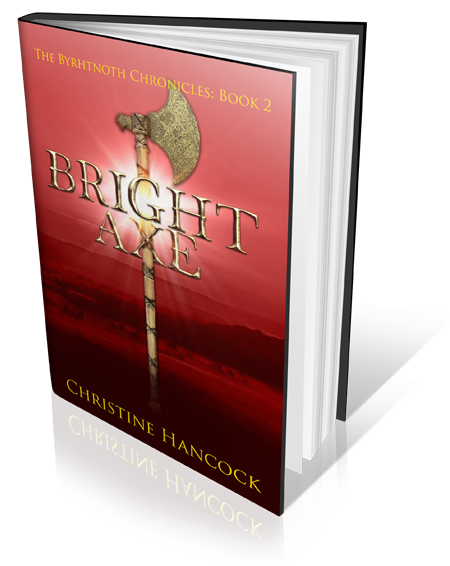 I’m new to the #HistFic community and was watching the conference via twitter, etc. and growing jealous of those who got to go. Thank you! It was great wasn’t it? I really enjoyed it and found it incredibly friendly and informative.